Iraq 2003, small US Military teams search urgently for WMD (Weapons of Mass Destruction), moving swiftly on “solid” Intel and each time coming up short. 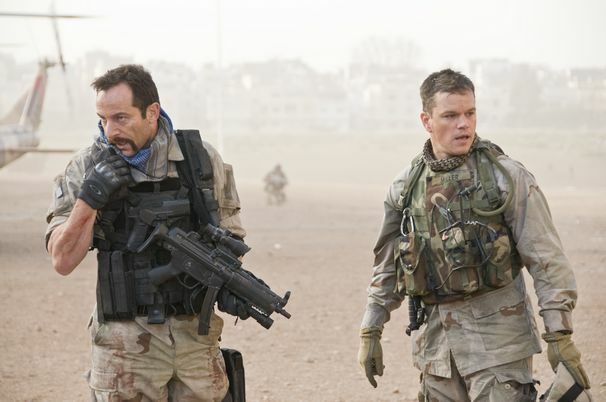 Paul Greengrass director of two Bourne movies now takes Matt Damon to an altogether tougher and dangerous place, not just Iraq but questioning American foreign policy and the reasons why the US invaded the country. This is perhaps a movie that needs two reviews, so let’s get the easy part out of the way first. The film is well made, employing many believable action sequences, some filmed using the directors trademark Steadicam or “Queasicam“, as some have dubbed the technique. Morocco and Spain standing in for the slightly less production friendly Baghdad. The dependable Matt Damon as Warrant officer Miller looks, sounds and acts the part as he moves gradually “off reservation”. This follows his inability to find any WMD’s that everyone, especially Washington, are so keen to find. Moving ever deeper into political territory, he is “used” by CIA agent (Gleeson) in an attempt to deal with a high ranking Iraqi Army general who may, or may not, hold the key to the Intel or lack thereof. If you are looking for a smart thriller with excellent action sequences you will not go far wrong with this film. Jason Isaacs and Greg Kinnear as “Gung Ho” military man and slippery “administrator” respectively, add solid support to the proceedings. Millers conversion from by the numbers soldier, to questioning maverick ultimately ignoring direct orders, occurs very quickly, perhaps too fast to be believable. This however is a necessary device to drive the plot forward within the running time. Lets move to the harder review, politics. One could argue, it’s got nothing to do with the movie but given the slant, politics has everything to do with the story. As Miller says “Aren’t we on the same side?”, “Don’t be naive” confirms the CIA operative. Costing around $100 (US) million to make, the film has thus far not returned that investment, despite being a competent thriller with an A list star. One does not have to look too far for answers. Depending on your views of the Iraqi war, these will colour your judgment of the movie. The film does not in any way diminish the soldiers contribution and does not profess to being based on a “true story”, so a lack of patriotism cannot be leveled against it. Do the circumstances and events seem believable, yes. Does the film perhaps portray a one sided and negative view of the justifications for the conflict, are the complex politics presented very simplistically as good and bad, most definitely yes. Is there any attempt to balance this view, no. Could any multiplex friendly two hour movie, ever hope to scratch the surface of such a complex situation, should filmmakers even try? More questions than answers, this must be left to the viewer to decide. Perhaps this is a film preaching to the converted and if so, it is unlikely to change any minds, hence the relatively poor box office especially in the US. So accept it as just good solid entertainment or take your side, there is no middle ground here. A solid action thriller set in Iraq during the 2003 invasion or a highly polemical political film that may divide audiences dependent on their world view. Audiences can decide for themselves.